Medium-sized square buckets are a bit too big to stack up in the shelves for kitchen or study organization. But it's just the perfect size to use as packaging container. Especially for businesses that need to ship products away, they might want to look at these 4 gallon square EZStor buckets and lids. 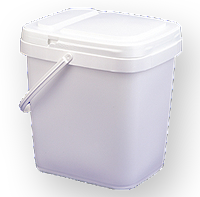 The 4 gallon square pail with width of 9 15/16", length of 12" and height of 12 7/8" is white in color and comes with a white, removable and reclosable lid, too. The lid includes tamper evident tear tab strips. With its nature being square, the 4 gallon square pail is definitely a great choice for packaging container, as it uses every space effectively. What types of things can you store in a square pail of this size? Well, almost anything. From food products (yes, it's food grade plastic container), office stuffs, clothings, and many other things. So if you run businesses that ship frequently, click here to purchase this amazing plastic container.